Bloomberg New Energy Finance finds that the center of the clean energy universe has shifted. Climatescope, a new report from BNEF, was released last week, and while many news outlets highlighted the finding that solar is now cheaper than wind, the report contains numbers that signal another major shift in renewable energy. The report focuses on "clean energy market conditions and opportunities in 58 emerging nations in South America, Africa, the Mideast, and Asia" and contrasts the progress of these poorer nations against the achievements of the OECD countries -- the wealthier nations of the world that are members of the Organization for Economic Co-Operation and Development. And for the first time, the developing nations are winning. 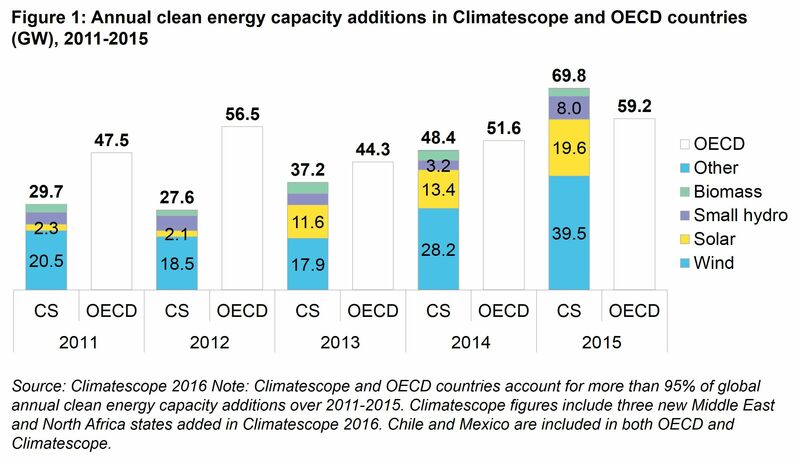 The 58 emerging-market economies aggregated in the Climatescope report set a record for clean energy deployed in 2015 with 70 gigawatts built, compared to the 59 gigawatts of clean power deployed in the 35 wealthier OECD countries. Cumulatively, the developing nations have won $154.1 billion in cleantech investment and added more clean energy capacity, with faster growth rates than the OECD nations using both those metrics. 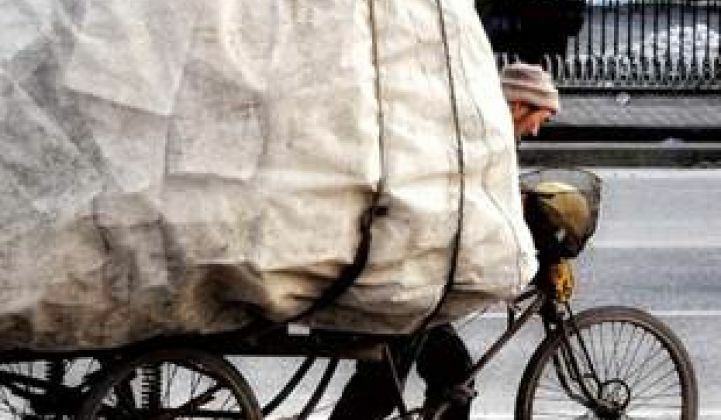 According to the report, 80 percent of the developing nations studied now have national clean energy targets, while three in four have set CO2 emissions reduction goals. China played a big part in this, but "less-developed nations also played a role." There is a downside to record rates of renewables being added to existing grids, and that's integration challenges. The report notes that some nations have built wind or solar projects despite not having the "associated transmission to deliver power" along with "grid operators [prioritizing] delivery" of power from fossil-fuel plants over those from renewable sources. Fixed-tilt utility-scale solar system costs in the U.S. are approaching $1.00 per watt, according to GTM Research. This same price decline is happening across the globe. The chart below shows the average cost of new wind and solar from 58 emerging markets, including China, India and Brazil. 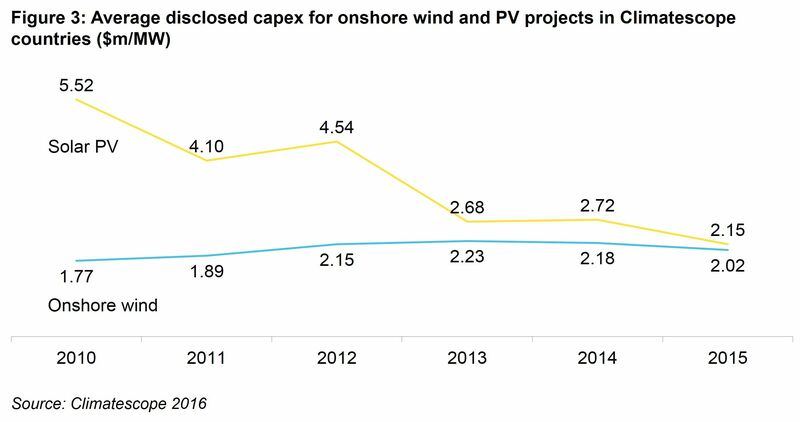 And while solar costs have been plummeting, the solar-wind cost crossover has occurred sooner than expected or predicted. According to the report, in 2016, "It’s likely that the total amount of solar photovoltaics added globally will exceed that of wind for the first time." The latest BNEF forecasts expect 70 gigawatts of newly installed solar in 2016 compared with 59 gigawatts of wind. Ethan Zindler, head of U.S. policy analysis at BNEF, was quoted by Bloomberg as saying, “A huge part of this story is China, which has been rapidly deploying solar” and helping other countries finance their own projects. "The world recently passed a turning point and is adding more capacity for clean energy each year than for coal and natural gas combined," according to the report. "Peak fossil-fuel use for electricity may be reached within the next decade."